The piano was an essential tool for Robert Schumann, both in his work as a composer and in his theoretical reflections. The continuing technical improvement of the instrument, e. g. through the expansion of its tonal and dynamic range, enhanced the available means of expression, and Schumann knew how to use them in practice and in theory. 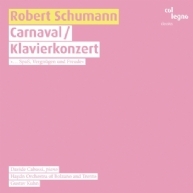 His composition Carnaval illustrates his skill particularly well: In spite of the strict conceptual approach, i. e. the use of notes as letters (described by Giacomo Fornari in the booklet), the music in these pieces on the subject of the carnival appears colorful, lively and relaxed. In his interpretation Davide Cabassi demonstrates the rare ability to perfectly link and refine these two levels. In the second composition, the Piano Concerto, Cabassi excels not only as a soloist but also in sensitive and competent ensemble playing with the Haydn Orchestra of Bolzano and Trento under Maestro Gustav Kuhn’s direction. So these two well-known works by Robert Schumann reveal the secret that good music needs both: heart and reason. The Mahlerlieder album concludes Musicbanda Franui’s inspiring trilogy about the art of the Lied in the 19th century. Franz Winter reads his thoughts on Beethoven’s symphonies, which are interpreted simultaneously by Gustav Kuhn. An outstanding get-together of music and words! Towering at the top of the art of Mass music – for the first time on CD, the Choir Academy of the Tyrolean Festival joins Gustav Kuhn and his Haydn Orchestra.